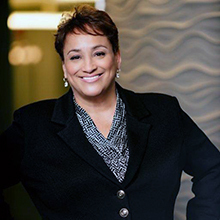 CHICAGO — Dynamic change agent, nationally recognized leader and former chief operating officer at the Library of Congress Jo Ann Jenkins brings her message of innovation to the 2016 ALA Midwinter Meeting in Boston as an Auditorium Speaker from 10 a.m. to 11 a.m. on Saturday, Jan. 9. With more than 25 years of extensive leadership, management, planning and business experience and a strong sense of social mission, she has repeatedly transformed organizations and led innovative policies at top levels of the nonprofit, philanthropic and public sectors. Currently CEO of AARP, the world’s largest nonprofit, nonpartisan membership organization, Jenkins is known for her ability to set priorities and get things done. At AARP, her signature rallying cry to Disrupt Aging! is designed to revolutionize society’s views on aging by driving a new social consciousness and sparking innovative solutions for all generations. “Disrupt Aging: A Bold New Path to Living Your Best Life at Every Age” is also the title of her forthcoming book, in which she sets out to change the current conversation about what it means to get older, touching on important issues facing people 50+ today and tackling new myths about aging—including that aging is a problem to be solved rather than a part of the human experience. Previously, as president of AARP’s affiliated charity AARP Foundation, Jenkins led far-reaching development and social impact initiatives, including Drive to End Hunger, a national effort to help the millions of older Americans who struggle with hunger every day. She went to AARP Foundation from the Library of Congress where, during her 15-year tenure as chief operating officer, she developed and directed high-profile projects including the National Book Festival and the Library of Congress Experience, in addition to overseeing a $1 billion budget and a staff of 4,000. Her many awards and special recognitions include the 2010 Women in Technology Leadership Award for her innovative work on the Library of Congress Experience and the Library of Congress Distinguished Service Award. She is also a Malcolm Baldrige fellow, recipient of the 2013 Black Women’s Agenda Economic Development Award for spearheading investments undergirding innovative social impact programs and one of the NonProfit Times’ Power and Influence Top 50 for 2013 and 2014 and Washington Life Magazine’s Power 100 for 2015. She received SmartCEO’s 2015 BRAVA award honoring top female chief executives. Jo Ann Jenkins’ appearance at Midwinter Meeting is sponsored by Perseus Books Group. Early bird registration—offering the best rates—is open until noon (Central) November 11. Advance registration is then open through noon (Central) Jan 4, 2016. Annual Conference registration and housing open noon (Central), January 19, 2016.